LAS VEGAS–(BUSINESS WIRE)–Barrett-Jackson ended the 2018 auction cycle in an incredible way at the 11th annual event in Las Vegas with record sales, celebrity guests from the entertainment and sports industries, and a celebratory final stop of the company’s first yearlong charity campaign, Driven Hearts. This year’s premier automotive lifestyle event in Las Vegas was held Sept. 27-29, 2018, at the Mandalay Bay Resort and Casino. In total 733 vehicles, nearly all at No Reserve, sold at a staggering 100 percent sell-through rate for a Las Vegas Auction record of more than $32.9 million, while nearly 400 pieces of automobilia brought in over $760,000, and $1,094,500 was raised through the sale of charity vehicles, bringing the total auction sales to more than $34.7 million. Celebrities from across the entertainment and sports industry were also a part of the auction action and included NASCAR driver Richard Petty, “Mr. Las Vegas” Wayne Newton, magician and entertainer Roy Horn from the famous Las Vegas duo Siegfried & Roy, and National Hockey League players from the Vegas Golden Knights: Brad Hunt and Brayden McNabb. Barrett-Jackson also honored the memory of Hollywood icon Burt Reynolds with the sale of the last four cars owned by the actor, including a Smokey and the Bandit Trans-Am Re-creation. In total, six vehicles sold to benefit charity during the three-day Las Vegas auction, highlighted by a 50th Anniversary Ford Shelby GT350 (Lot #3003) that sold in support of Barrett-Jackson’s Driven Hearts campaign, which raised $215,000 for the American Heart Association. The local Las Vegas community was also supported with the sale of a 2018 Ford Mustang GT Coupe Premium (Lot #3004) that features a custom Vegas Golden Knights wrap with the team’s logo and the words “Vegas Born.” Hunt and McNabb took the stage to support the sale that raised $250,000 for Las Vegas-based non-profit Grant a Gift Autism Foundation. Automobilia sales also highlighted the excitement of this year’s Las Vegas auction, including items from the coveted Robert K. Haines Sr. Estate Collection. Setting a Las Vegas record at $63,250 was a one-of-a-kind custom Gilmore Gas Station island restored to the highest standards by McLaren Classic Restorations (Lot #8247). Barrett-Jackson kicks off the 2019 auction year with the 48th Annual Scottsdale Auction, January 12-20, 2019, at WestWorld of Scottsdale. Advance tickets and All-Week ticket packages are currently available at Barrett-Jackson.com. Consignments are also being accepted via the online application or by calling 480-421-6694. 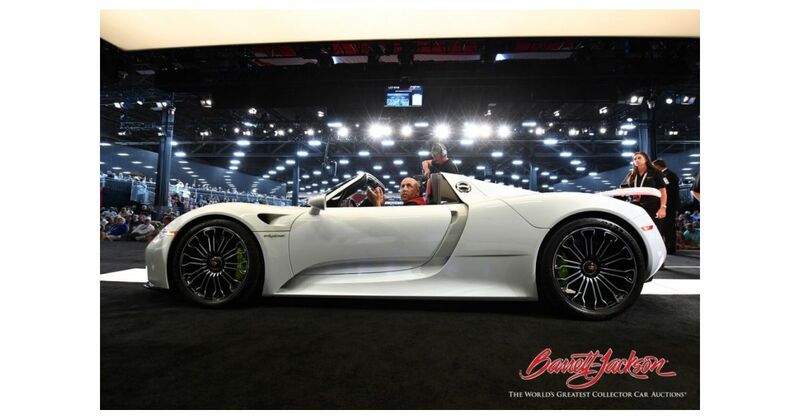 For information on becoming a bidder, visit www.Barrett-Jackson.com/bid. Also, follow Barrett-Jackson on Facebook, Instagram, LinkedIn and Twitter for the latest news and information heading into the 2019 Scottsdale Auction.